Ella Raines as Carol "Kansas" Richman and Alan Curtis as Scott Henderson. 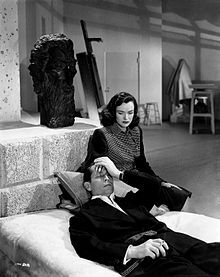 Franchot Tone as Jack Marlow with Ella Raines as Carol "Kansas" Richman. Phantom Lady is a 1944 film noir about a beautiful secretary who risks her life to try to find the elusive woman who may prove her boss didn't murder his selfish wife. Directed by Robert Siodmak. Written by Bernard C. Schoenfeld, based on the novel by Cornell Woolrich. What a place. I can feel the rats in the wall. Cliff Milburn: You and I are going to have fun tonight, Jeannie! You like jive? Carol Richman: You bet! I'm a hep kitten! Scott Henderson: Hello, Kansas. Renew my membership to the Architects and Engineers Association and call Mason and Follett, the contractors, and make an appointment with them for tomorrow morning. Scott Henderson: Uh, uh, uh, don't hang up. You know you're having dinner with me tonight, and tomorrow night, and the next night, and then every night. Scott Henderson: ... every night... every night... every night. The most talked about mystery in ten years! A STORY THAT HAS THRILLED MILLIONS!